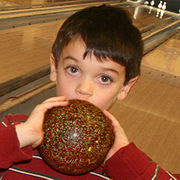 Bowling, it is one of the great American past times, like baseball, apple pie, you know the ones. So I was shocked today to realize that here in Maryland they do not have the same type of bowling I am used to. Ten-pin bowling = traditional bowling. According to Wikipedia commonly referred to as "bowling" in the United States. 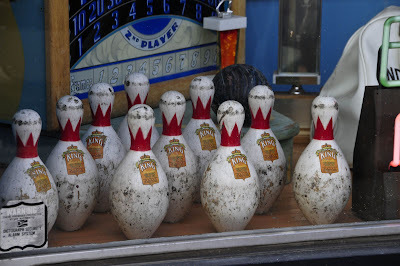 Duckpin bowling = some crazy variation in Baltimore, Maryland, Massachusetts, Rhode Island, and Connecticut. It involves tiny 2-4 pound balls with no finger holes, you get three balls per frame, and the pins are shorter and lighter. Camera phone pictures, FiFi, see the Maryland state flag in the background? This really threw me for a loop. 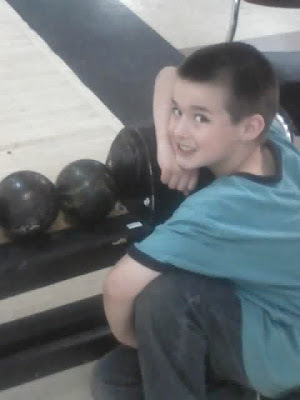 Can I raise my children in Maryland where they don't even have real bowling? 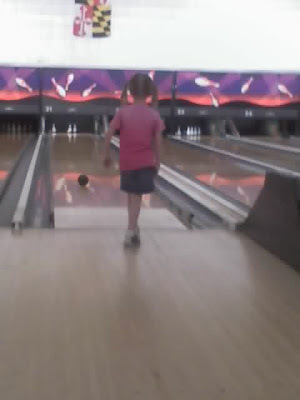 Are my kids going to grow up thinking this mini ball bowling is normal? I would like to think of myself as a rather smart, college educated woman who knows about life in America and day to day things. So readers, has anyone heard of this or am I just crazy? WHAT!?! No way, I have never heard of that. Hi! I just saw through Katherine's blog that you just moved to MD. WE live in Northern Baltimore county. Where are you? I've never seen that type of bowling! Odd, but informative! I made a D in bowling in college.